Title text: "I'm trying to get the page locked because some jerk keeps adding "Yachts"." Title text: "If I wait a while, it's not so bad, because then it's just shaped like me, plus some pipes and tanks and probably eventually all of Earth's oceans." Marine bioligy: well what about sharks? Laser optics: well what if you attach the lasers to the sharks? ISSUE: If we wait long enough, the Earth will eventually be consumed by the Sun. "You won't believe what this seagul did! Number 5 will amaze you"
rhomboidal wrote: Those old Zip disks were great. They were like 1.44 floppies on steroids. Unfortunately, quickly banned from competition. I don't know, to me Zip disks were always a bit "fingers crossed it doesn't fail" while copying. Seeing this once again reminds me of how I deleted all StarCraft 1 levels, Duke Nukem 3D levels, and secondary school .doc homework files that I made, as "cleanup". Whyyyyyyy did I not keep them? gorilla.bas is something I heavily modified as well! Why is everything around the Earth white, while at the distance planets are near each other? I think reality is not like that, it's more uniform in that zone. Thanks! For commits that are not of public importance, I have one simple short unique comment. Then whenever I want to commit, I press ctrl+r (reverse history search in bash terminal), that comment, and the commit command automatically comes up. Very handy. I read the news about the balloon Loon internet, but still don't get the joke. Except the title text, that one is funny. Why does the guy say auch? Does the balloon hit his back? Why does the balloon talk? What is the joke, if any? I don't understand this one! I know the rose petals must have something to do with love, but I still have no clue what this is about. 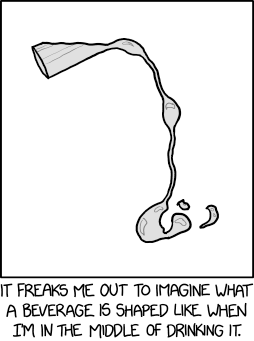 Usually XKCD's have some funny catch or are a reference to something. I don't see the catch here, and don't know what the reference is. There is no new XKCD today! Oh the drama! AvatarIII wrote: technically aren't all swords forged in stars, since it requires stars to create iron? Sure, just remove every part of the star that isn't the sword. Microwaves with buttons have a horrible user interface imho. I prefer one dial for time, one for watts. Topic: What-if 0009: "Soul Mates"
Once two people found each other, they are removed from the search pool, making the search simpler for the rest. Only half as much eye contacts as described are needed! I love XKCD, a lot of the comics are extremely good, funny, interesting or true. 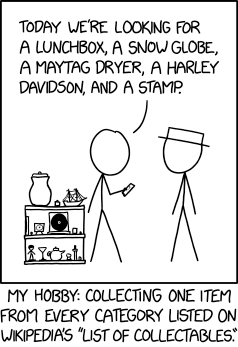 I'm going to be so honest to say that this was one of the weakest XKCD's in a while. Can the forum link please go somewhere on the main page? I love reading the forum posts about an xkcd comic. If not in the top left (it seems to disappear there too often), can it go somewhere else, like the bottom of the page or whatever. Wow, that is one UGLY car! What are "city offic es"? A GOOD phase that is! Hopefully this phase lasts a while, I loved all etymology man occurances so far! This comic is tl;dr. Plus I've got no idea who the names are and what wait wait is a reference to. How do you like the comic? Topic: #### "Five-Minute Comics: Part 4"
Re: #### (Unposted) "Five-Minute Comics: Part 4"
Um, Microsoft Encarta 2005, and you find that OLD? What are you, a kid? Gammew wrote: Noooooooooooooooooo!!! Not the 0.99...=1 debate! Isn't that the most banned discussion ever on this forum? What, do you mean there exists any serious actual mathematician who believes 0.99... is not equal to 1?